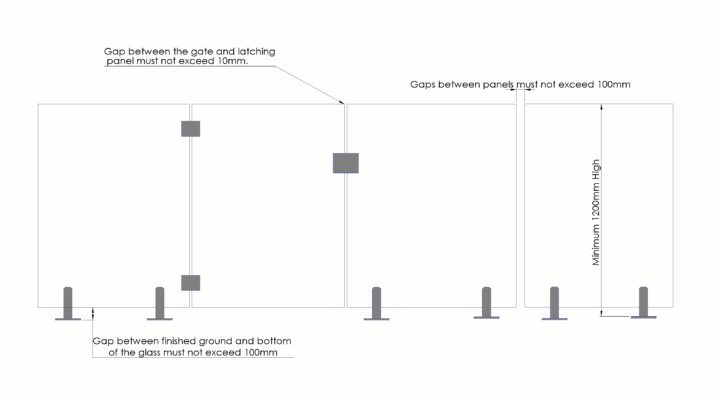 If the latch is located less than 1500mm from the ground level, it will have to be located on the interior side of the gate panel (toward the pool) in such a way that there is 1500mm distance from the ground level outside the fence, to the latch on the inside. Whether you are thinking about installing a new pool in your home or if you have an existing one, there are several safety guidelines and precautions that you must abide by to ensure your pool is up to code. This becomes even more important if you will be selling or renting out your new property as the “Swimming Pool Act, 1992” has now been amended to include clauses that specifically address the sale and lease of properties post April 28, 2016. A full copy of these regulations can be found at Fair Trading NSW, however we have summarised the key points below. Regulations aside, having a pool that is not fenced is a major safety concern. This becomes even more imperative if you have young children living in your home or who often visit. For children who are under the age of 5, drowning is the major cause of death that is classified as “preventable”. For this reason, the “Swimming Pools Act of 1992” was updated in 2012 to address these issues. What do these changes mean to you? The following points should clarify what you need to know. You must then have your pool inspected by an “accredited certifier” who has been registered with the building professional’s board or you can contact your local council for more information on how to get certified. If you are leasing out your property: you require a relevant occupation certificate or a valid copy of your certificate of compliance. This must be included with your tenancy agreement when you rent out the property. Note: This does not apply if your rental property is part of a strata lot or community schemes with more than 2 lots. If you are selling your property: You will need either of the above, or a certificate of non-compliance. This must be attached to your sales contract. As per the rental clause, this change does not apply if you are part a lot in strata, in community-schemes with greater than 2 lots or if your home is off-the-plan. Do These Changes Apply to me? If you own a property with a spa or swimming pool, then these laws will apply to you. If your property is part of a community scheme or a strata, the laws still apply however it is the responsibility of your body corporate to ensure that your pool is in compliance with any regulations. Which types of pools need to comply with these changes? This law applies to any vessel, structure or excavation that are capable of being filled with 30cm or more of water or has been adapted for human aquatic activity. It is the responsibility of the agent or the landlord to ensure that swimming pools meet the requirements of the “swimming pool act 1992” prior to leasing out the property or when an agreement has been entered in to. This law is effective as of April 29, 2016 and applies to all properties except those that are in a strata lot or community schemes of more than 2 lots. If you are the tenant who is leasing a property after April 29, 2016, ensure that your lease includes a certificate of compliance for your swimming pool. Proof that the pool is currently registered, accompanied by an occupation certificate which has been issued within 3 years of the sale. Note: If this certificate is not provided when required, you as the buyer have the right to negate the contract with 14 days (unless you have already settled). What is a certificate of non-compliance and how will it impact the sale of a property with a swimming pool? A certificate of non-compliance is issued by the seller to the buyer which essentially passes on all onus of meeting regulations from the seller to the buyer. If this has been included in the documents of sale, the buyer is agreeing to take on this responsibility, and has 90 days to rectify any issues from the date of settlement. They will then need to obtain a valid certificate of compliance to ensure that they have met all requirements. What is an occupation certificate and how does it relate to the swimming pools act 1992? An occupation certificate allows you to occupy a building by proving that the structure has met the requirements of the Building Code of Australia and the Australian Standards. This certificate can only be issued for new buildings within 12 months of the building first being used. With regards to meeting the swimming pools act, this is only valid if the certificate of registration is less than 3 years old and the certificate specifically authorised the swimming pool being used. Your pool is fully fenced around the perimeter at all times, which separates your house and any adjoining structures with the pool. The pool fence is completely compliant with the Australian Standards for pools. If you are looking for pool fencing that is fully compliant with the Swimming Pools Act of 1992 and the Australian Standards, Avant-Garde Glass provided beautiful frameless glass fences at an affordable rate. Contact us today to find out how we can help.